1929 the Whole family moved to Hang zhou. When ShaMenghai held a post in the provincial government, whore commended him in to Shanghai Changming Special School of Art. 1930 ShaWenham (the third younger brother o fShaMenghai) returned to China from Soviet Russia, who disseminatedrevolutionaryidea to him. 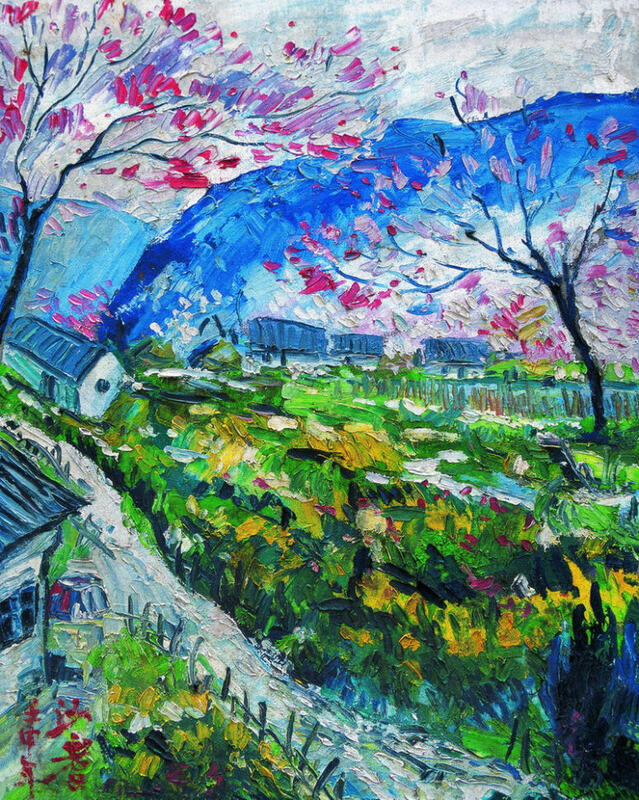 Sha Qi is known by many names: Born Sha Yinnian in the village of Sha, part of Yinxian County in Zhejiang, China (1932), he would also be dubbed Sad Ji in his European travels, and eventually called the Eastern Van Gogh by the end of his career. 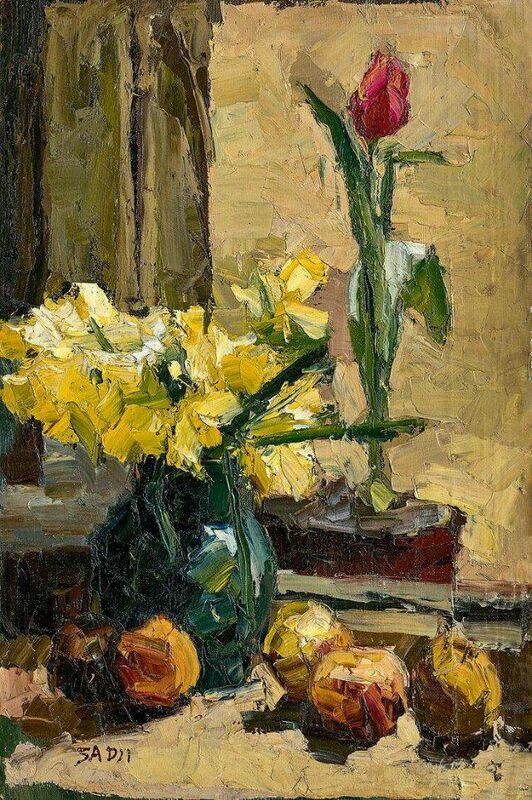 The intense beauty and tragedy that permeated his life and artwork was recognized during his early years, neglected in his later years, then fortunately rediscovered before his final days; so his prolific body of work continues to gain praise and excite the world of art today. 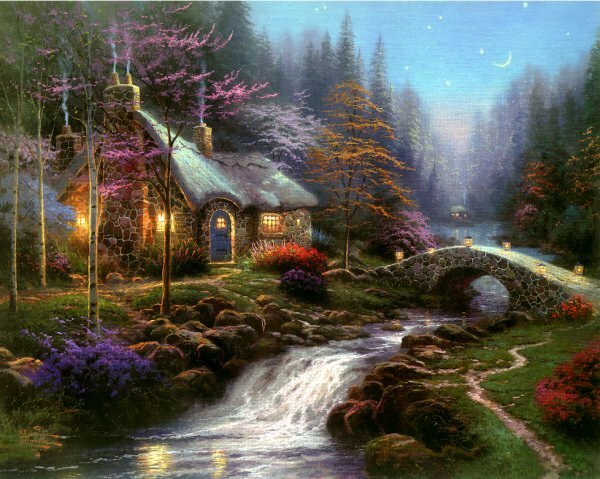 Sha Qi studied painting first at the Shanghai Arts School, then the Central University of China. His studies were interrupted, though, when Japanese armies invaded China. Sha Qi was not one to sit quietly by, and was arrested in 1933 after years of petitioning and demonstrations along with other Shanghai students. He spent a full year imprisoned by Kuomintang authorities, but after release he took a job at the Art Department of Central University in Nanjing. He worked then alongside his cousin and friend, Sha Menghai, who would go on to be a master calligrapher. It was at this same time Xu Beihong came into his life. Then Director of the Art Department, later to become President of Central Academy of Fine Arts (Beijing) and the Chinese Artists’ Association, Xu turned out to be a crucial guide and friend to Sha Qi, recognizing his talent and passion in art and spending the rest of their years together teaching, mentoring, promoting and protecting Sha. It was Xu that introduced Sha to the Belgium Royal Academy of Fine Arts, where he would learn Western painting under Professor A. Bastien (who also taught famous Chinese painter Wu Zuoren, 1908-1997). With his excellent teachers, Sha Qi quickly found his way as an artist. 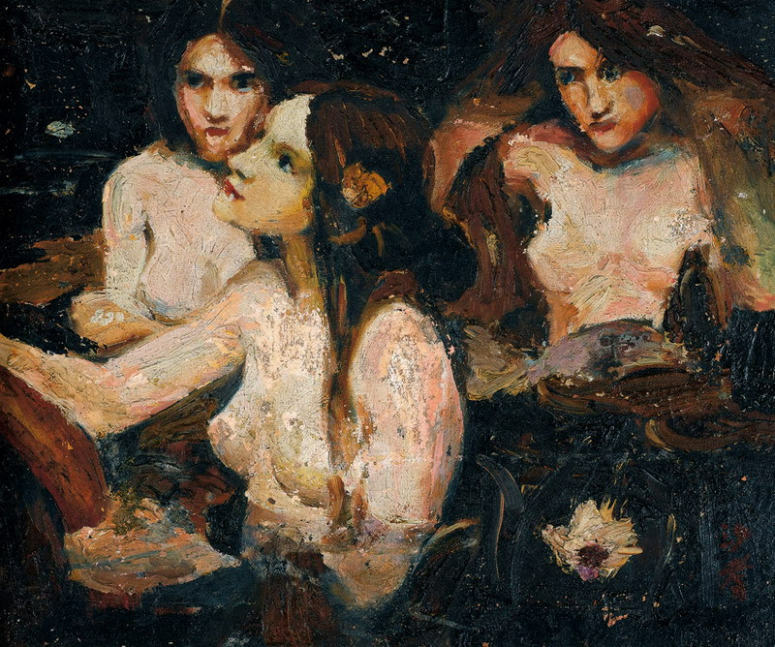 In 1939, his grades in sketching, oil painting and sculpture classes won him a Golden Medal in Fine Arts. 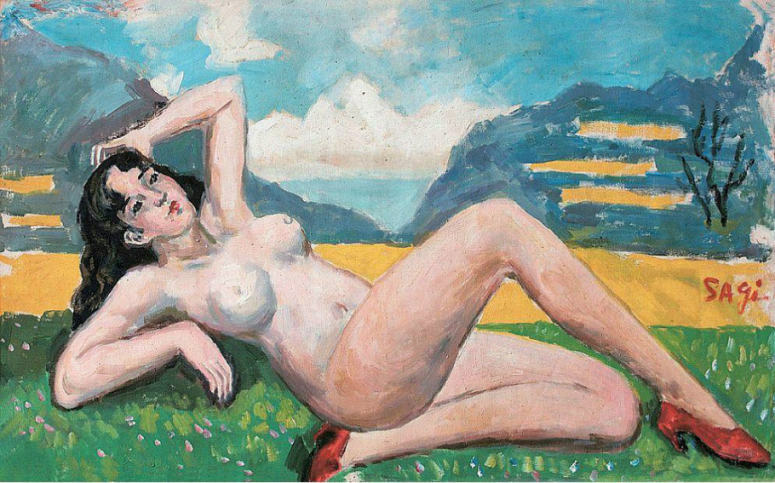 He held many solo shows in Brussels, and in 1940 he was showing alongside Pablo Picasso at Atriome. 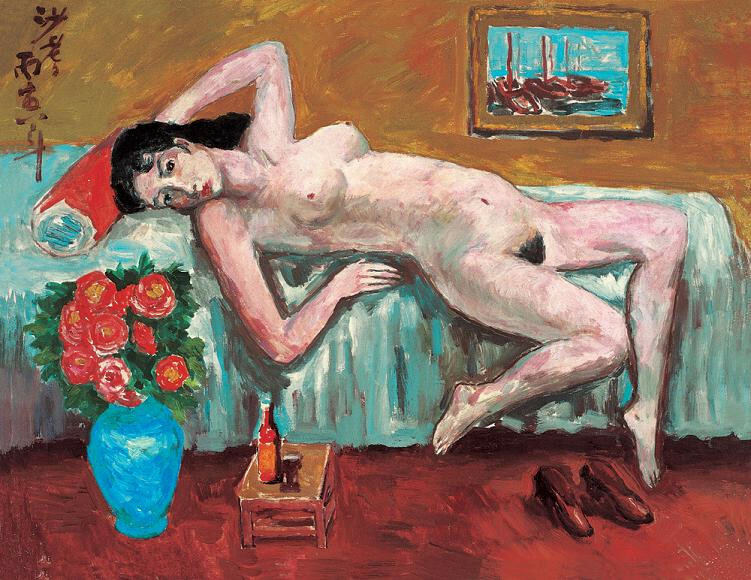 His painting titled “Girl Playing Flute” was purchased by the Royal Family of Belgium in 1942. 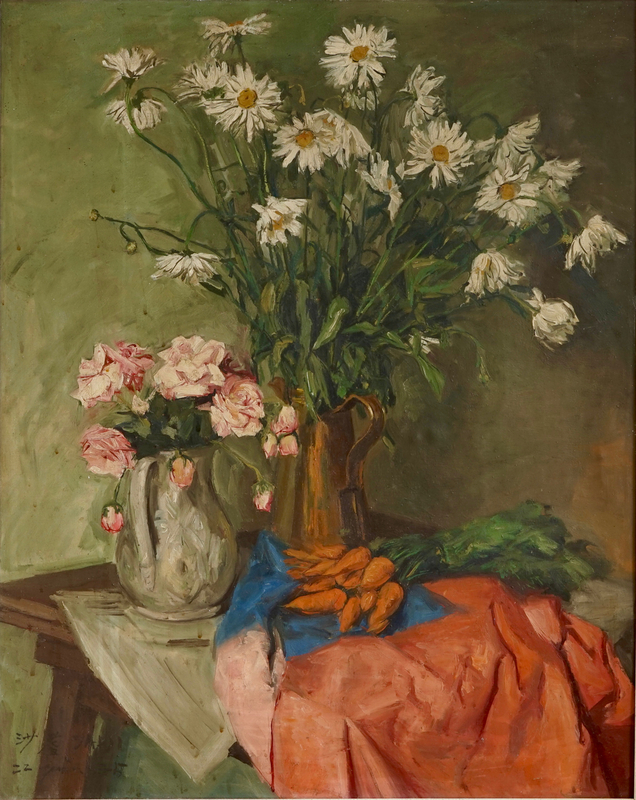 During these years of study in Europe, Sha’s style developed from academically notable to stylistic, as exhibited in his painting “Studio at Royal Academy of Fine Arts”, one of the first to be accented by expressive brushstrokes that would soon become trademark of his work in Belgium. 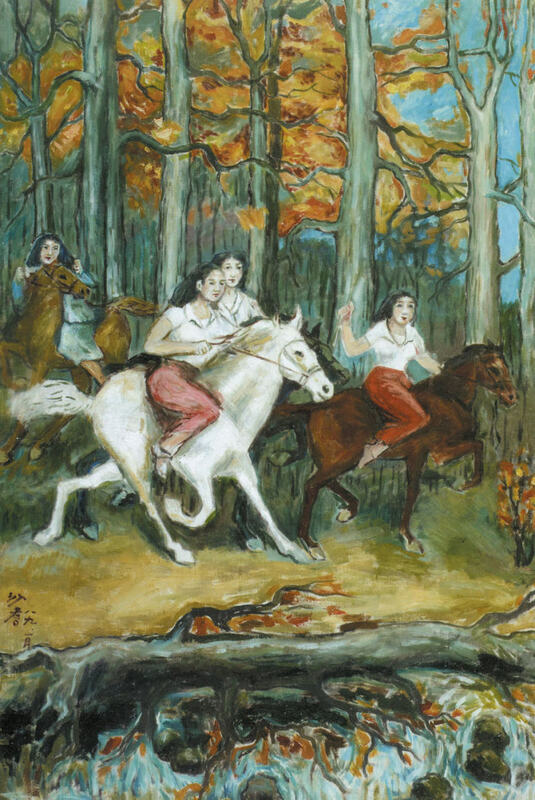 By the time he moved back to China in 1946, ‘Sad Ji’ was a well known and beloved artist in Europe. At first Sha went right to work alongside his friend Xu to restore art education in their war-torn country, accepting a high-level position as professor at Beiping Special School of Art (later to grow into the Central Academy of Fine Arts). Unfortunately, he was not able to maintain the position when he fell very ill. It would seem the impact of war and prison, plus the emotional blow of his wife leaving him with their only son, pushed Sha over the edge. He was diagnosed with Schizophrenia, and the disease took a heavy toll on him. When word spread of his illness, Xu and Premier Zhou Enlai, in honor of his contributions to his country, made arrangements for the government to support Sha through a life-time monthly stipend. In a desperate state, with only his elderly mother to care for him, Sha’s ex-wife did eventually return their son, Tianxing, to live with him; and this was a great comfort to Sha in these long years of illness. 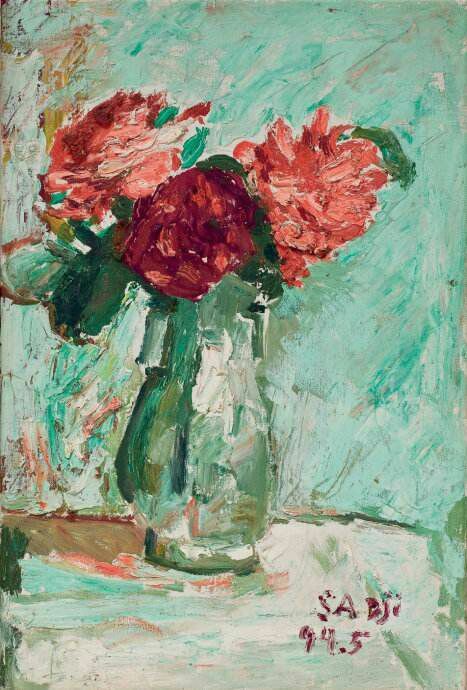 After his friend, Xu, died in 1953, Sha seemed forgotten by his country and art community at large. Tianxing claims his father never stopped creating art during this time, though; often turning to old newspaper or wood, and using ash from cooking pots as paint. He would mostly hand out these pieces as gifts to neighbors, though anyone receiving his art during this time likely viewed him as nothing more than a madman, and would probably have burned or thrown away such works without understanding the value. Sha’s old cousin and friend, Sha Menghai, the famed calligrapher, restored some of Sha Qi’s earlier Belgium works which had been donated in 1978 to the Zhejiang Provincial Museum where Menghai held position as Director. 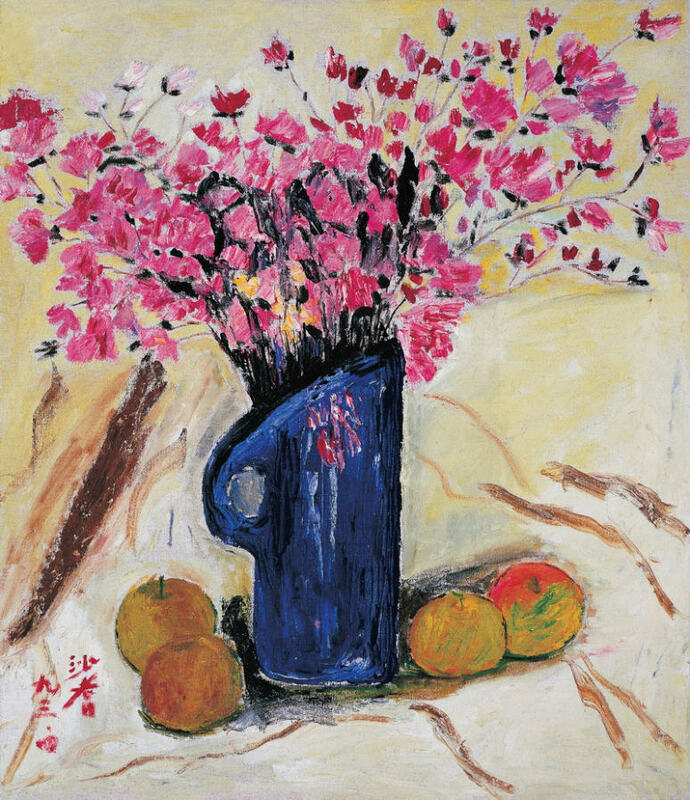 Later, Cousin Menghai would organize a major show with these and more of Sha’s works, exhibiting 50 pieces in a solo show (1983) that would travel to Shanghai, Beijing, and Hangzhou, where the China Art Museum would keep 3 paintings. The show served to remind the art world of this forgotten talent, and also gave Sha encouragement to create again. Sha was invited to join the Shanghai Cultural-Historical Research Society in 1984, and the following year he showed his works throughout China and picked up the brushes again to create a new landscape series. 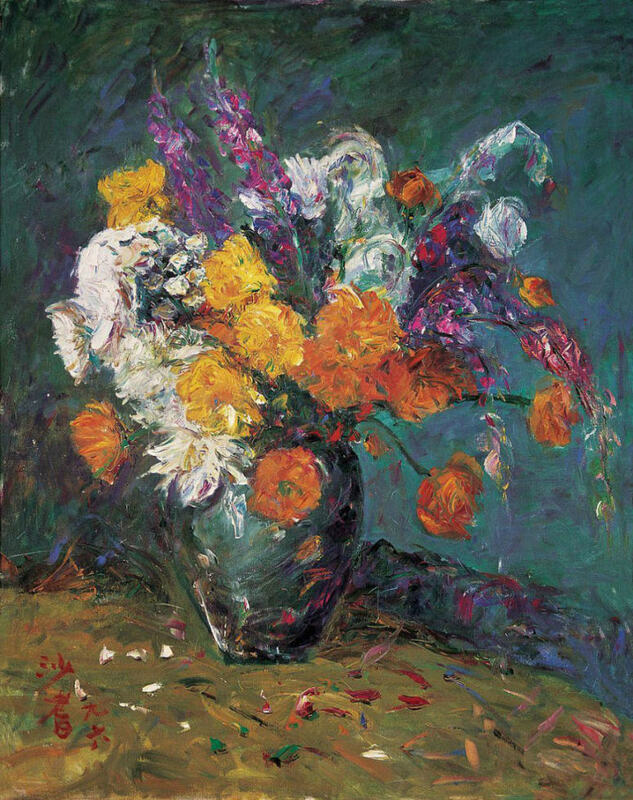 His final works are now recognized as his most successful, “striking for their bold use of colors and the unusual spontaneity of strokes,” artist Yan Shanchun proclaimed. In the last few years of his life, Sha Qi was too sick to understand that his fame was steadily spreading. When he passed away in 2005, he left behind a large and growing crowd of admirers, students, a loving son, and a sizeable body of work that clearly tells the story of an artist’s changing and maturing approach to a range of subjects as wide as life itself, from portraits to still lifes, animals to landscapes, reflecting all that could imaginably be reflected in art- including high abstraction in his latest works. Though much of his work is now recognized and preserved, we have yet to see what lingering artwork may still be revealed as the provenance of his life’s work continues to come to light, piece by piece.